I’ve heard it said that as sewing types we tend to fall into two categories: those who begin a project with a pattern or those who begin a project with a fabric. I tend to do both- sometimes it’s the pattern, sometimes it’s the fabric. 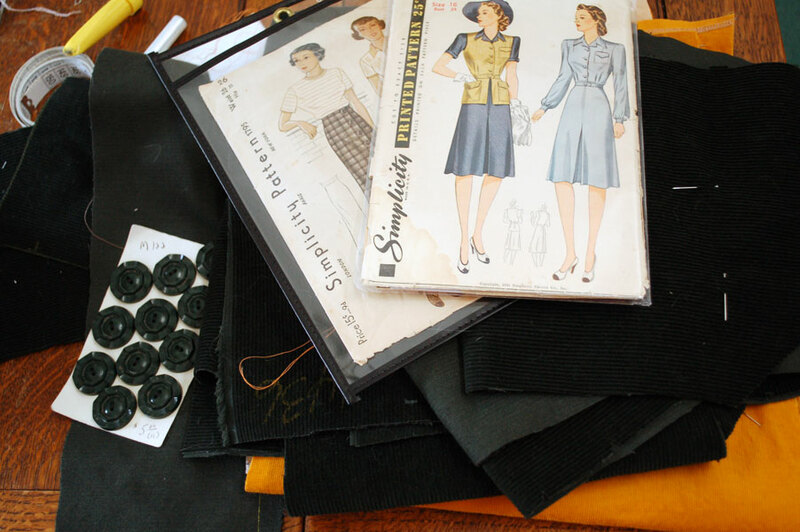 Most of the time I like to “shop the stash.” But this project began with the fabric! I was meandering the local fabric store looking for something completely unrelated to this project when I saw a lovely mustard colored fine corduroy laying on the remnant tables. I have an absolute weakness for this color- it just screams “make me into something vintage!” So, being the obedient seamstress that I am, I bought it. There was only a tad over a yard and not even a full width. So a the cutting table it said “Make me into a 1940’s jerkin!” and I agreed. A few weeks prior I had found a great wide wale corduroy in deep forest green that said “Make me into a 1930’s skirt!”, so I thought if I combined the two I might *just* have enough to squeak out a jerkin with pockets AND the skirt. And believe me, I barely, barely made it. See, cordoroy has something which I always forget it has… the dreaded nap. Fabrics with a nap tend to take more fabric than called for initially because you must cut the pattern with all pieces going in the same direction. But I barely, BARELY made it! Here’s the two patterns with their buttons and fabric laying on the table, waiting to be made up. Do you ever have a pattern in your stash for years, and when you finally get around to making it, you find out it’s missing a bunch of pieces? That was the way with my copy of Simplicity 3742. Who knows where I found it, but I was totally bummed to open it up and find that most of the jerkin pieces were missing. The big bits were there, but it was unfortunately missing most of the other pieces. The construction was not at all what I was expecting, either. In my brain more smaller pieces meant more ways to wiggle out the pieces on my fabric, but this jerkin, regardless of having an attached belt, was cut full fronts and backs and then the belt was sewn on AFTER construction. In my brain I thought it would have separate peplums, belt pieces, and front and backs. Anyways, this ended out working in my favor, as I decided to make the belt separate so it could be removable. This way, the jerkin can be worn both with skirts and buttoned up the front, or left open and casual a la Miss Kate Hepburn (and McCall 4583 which was also a contender for this project, but unfortunately it would not fit on my fabric). For the missing pieces I drafted up a belt and based the pockets on those from another pattern and drafted a smaller one for upper pocket. Here’s a few shots of everything just basted together and pinned to the dress form. I was really, REALLY uncertain about it at this stage, thinking it was going to be rather costume-y, but my husband took one look at it and said it was his favorite thing I ever made so I stuck it out. I had some smallish scraps left over, but there was enough to cut bias strips both for my armhole facings and to make some self cording for the pocket! I had wanted to make an initial on something FOREVER, so it was fun to finally do it! I attached the cording by hand to the wrong side of the fabric before I attached the pocket to the jerkin. And here it is finished! 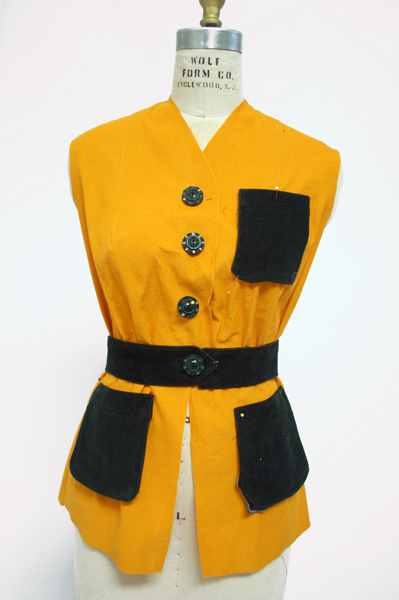 I only had four of the green buttons for this project since I wanted to use the remainder for the 1930’s skirt I’m sewing next, so the belt of this piece got a big bakelite button I had been hording in my button stash. Here’s another close up of the pocket and the bound buttonholes I made for this project, and another showing the jerkin sans belt. When I wear it that way I plan to wear it open with trousers and a shirt underneath. Of course, now that the jerkin is finished I don’t actually have anything to pair it with, so an ivory 1940’s skirt and green skirt have been added to the sewing list! Hope you’re having a lovely weekend! « Newest Pattern Now Available for PreOrder! Hmm I really like it without the belt. I do an awful lot of squeezing pattern pieces onto inadequate yardage as i buy a lot of 2nd hand fabrics, but the feeling of ‘winning’ is such a boost. I just ADORE this! I so want to make a jerkin and I just love this version with the pockets and the belt! 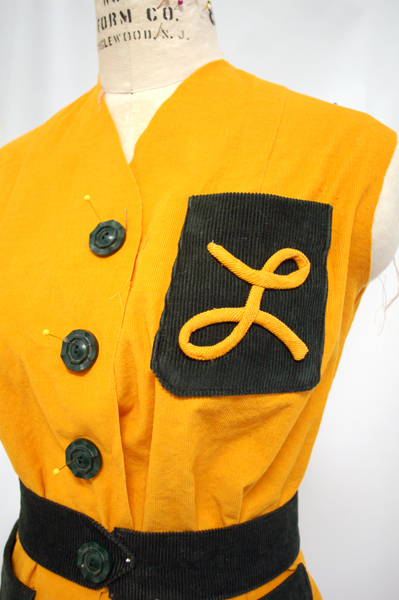 And oh the ‘L’ on the pocket is PERFECT! Love it and can’t wait to see it paired with the skirt!!! Thank you!! Eventually when I make the skirt and blouse I’ll make sure to post pics. I can’t wait to see your jerkin!